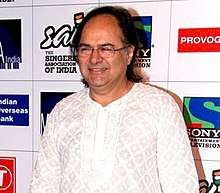 Farooq Sheikh (25 March 1948 − 28 December 2013) was an Indian actor, philanthropist and television presenter. He was best known for his work in Hindi films from 1977 to 1989 and for his work in television between 1988 and 2002. He returned to acting in films in 2008 and continued to do so until his death on 28 December 2013. His major contribution was in Parallel Cinema or the New Indian Cinema. He worked with directors like Satyajit Ray, Sai Paranjpe, Muzaffar Ali, Hrishikesh Mukherjee and Ketan Mehta. He acted in serials and shows on television and performed on stage in productions such as Tumhari Amrita (1992), alongside Shabana Azmi, directed by Feroz Abbas Khan, and presented the TV show, Jeena Isi Ka Naam Hai (Season 1). He won the 2010 National Film Award for Best Supporting Actor for Lahore. Shaikh was born in 1948 at Amroli, a village in Vadodara, Gujarat, to father Mustafa Shaikh and mother Farida. His father Mustafa Shaikh was a lawyer settled in Mumbai, whose family hailed from Hansot village (Bharuch district, Gujarat). Shaikh's family were Zamindars (landowners), and he grew up in luxurious surroundings. Shaikh was the eldest of five children, and grew up in Nagpada, Mumbai, where his father had settled down to practise law. Shaikh attended St. Mary's School, Mumbai and then graduated from St. Xavier's College, Mumbai. He then studied law at Siddharth College of Law, Mumbai. His father had a successful law practice, which prompted Shaikh to take up law initially. Shaikh came to acting after failing to relate to his profession in law. It was at St. Xavier's College that Shaikh met Roopa, his future wife. Both of them were active in theatre while at college and later they were married. Shaikh's stint at St. Xavier's was important for both the personal and professional aspects of his life. He made many friends there, including Sunil Gavaskar, who was a contemporary. His interest in theatre took flight while he was at St. Xavier's, and among the other theatre enthusiasts there was Roopa, who was his junior at St. Xavier's College. Actor Shabana Azmi, then known mainly as the daughter of noted poet Kaifi Azmi, was Roopa's classmate. Shaikh thus developed both his theatre skills and his professional network during those years. He married Roopa some years after graduating from St. Xaviers. They have two daughters, Shaaista and Sanaa. His younger daughter Sanaa works with the NGO United Way Mumbai. In his early days, he was active in theatre, doing plays with IPTA and with well-known directors like Sagar Sarhadi. In 1973, while Shaikh was in his final year of law school, MS Sathyu approached him for his directorial debut Garam Hawa. His first major film role was in the 1973 film Garam Hawa, where Farooque had a supporting role and the leading man was Balraj Sahni. The film is credited for being a pioneer of a new wave of Hindi Art cinema. His salary for his debut film was only Rupees 750. He first gained recognition as a quiz master on radio, but it was his participation as an anchor on Bombay Doordarshan shows such as Yuvadarshan and Young World that made him a household name. Sheikh in Gaman (1978) acted as the migrant Bombay taxi driver from Badaun in Uttar Pradesh dreaming about returning home to meet his wife, but never saves up enough to return home. He went on to act in several notable films such as Satyajit Ray's Shatranj Ke Khiladi (Chess Players) (1977), Noorie (1979), Chashme Buddoor (1981), Umrao Jaan (1981), Bazaar (1982), Saath Saath (1982), Rang Birangi (1983), Kissi Se Na Kehna (1983), Ek Baar Chale Aao (1983), Katha (1983), Ab Ayega Mazaa (1984), Salma (1985), Peechha Karo (1986), Biwi Ho To Aisi (1988) and Maya Memsaab (1993) . He formed a successful pair with Deepti Naval. He also did a slightly negative role in Katha. In 2002, in an interview with the Times of India Shaikh said, "I have never been commercially viable: People recognise me, smile and wave at me — but I have never received marriage proposals written in blood. In his heyday in 70s and 80s, when Rajesh Khanna drove down a street, the traffic stopped — I don't mind not receiving this kind of adulation. But I do miss not having been able to command the kind of work I wanted which Khanna could always do. I miss not being 100 per cent commercially viable like him." In the 1990s, he acted in fewer films. But resurfaced in notable roles in the 2000s. He appeared in Saas Bahu Aur Sensex (2008) and Lahore (2009), for which he won the 2010 National Film Award for Best Supporting Actor.He appeared as Bunny(Ranbir Kapoor)'s father in Yeh Jawaani Hai Deewani (2013). His last film as the leading man was Club 60 (2013) which was also his last release before his death. Realbollywood.com said about his performance in the film: "As a grieving father who won't allow his loss to be forgotten, he hits all the right notes treading that thin line between melancholy and maudlin with majestic grace." He also appeared in Youngistan and Children of War, both of which released in 2014, after his demise. In the late 90s, Farooque Shaikh appeared in several television serials. He played the title role in an episode dedicated to the poet and freedom fighter Hasrat Mohani in the TV series Kahkashan (1988) with Deepti Naval playing his wife. He also worked in the famous TV serial Shrikant which aired on Doordarshan from 1985 to 1986. This show was an adaptation of Sarat Chandra Chattopadhyay's novel. Aahaa on Zee, Chamatkar on Sony and Ji Mantriji (an adaptation of Yes, Minister),on Star plus were other notable successes. Shaikh also had a cameo in Life OK's Do Dil Ek Jaan, where he was seen as the leading lady's father in the initial episodes. He compered the Binny Double or Quit Quiz contest, which was telecast over Vividh Bharati. He also performed on stage in famous plays such as Tumhari Amrita, directed by Feroz Abbas Khan, featuring Shabana Azmi. A sequel to this play was staged in 2004 titled Aapki Soniya, with Farooque Shaikh and Sonali Bendre as main leads. Tumhari Amrita completed its 20-year run on 27 February 2012. He directed Aazar Ka Khwab, an adaptation of Bernard Shaw's Pygmalion in 2004. He hosted the TV show Jeena Issi Ka Naam Hai, in which he interviewed Bollywood celebrities. His sense of humour and direct humble approach was the USP of the show. Lesser known is his contribution to the UNICEF polio eradication programme. He made several extensive trips to two polio-endemic states, Bihar and Uttar Pradesh, and worked closely with its programme teams who were working with communities to get greater acceptance for the polio vaccine. Farooque Shaikh died of a heart attack in the early hours of 28 December 2013 in Dubai, where he was on holiday with his family. His funeral prayers, held in Mumbai at Millat Nagar Andheri Mosque on 30 December 2013 in the evening, were attended by many personalities, including Javed Akhtar and Shabana Azmi. He was buried in Muslim Qabristan, Four Bungalows, Andheri West. His grave is near his mother's. On 25 March 2018, search engine Google commemorated Farooq Sheikh with a Doodle on his 70th birth anniversary. Google commented: "Farouque Shaikh essayed agonizing heartbreak and light-hearted comedy with equal ease. Beyond the silver screen, Shaikh was integral to Indian theater, and his epistolary play, ‘Tumhari Amrita’ with Shabana Azmi delighted audiences for over two decades." ^ Getting nostalgic about Farooq Sheikh Rediff.com, 4 September 2008. ^ Writing its own destiny Archived 11 September 2012 at Archive.today Screen, Namita Nivas, 28 November 2008. ^ "And the National Award goes to..." The Times of India. 17 September 2010. ^ "Farooque Shaikh to be laid to rest near his mother's grave in Andheri today". ^ "Amyra Dastur to Farhan Akhtar: Prominent Parsis in Bollywood". ^ Farooque Shaikh: The big picture The Times of India, 14 September 2002. ^ "Happy Choices". screenindia.com. Archived from the original on 31 August 2008. ^ "Veteran actor Farooq Sheikh passes away". The Telegraph. Calcutta, India. 28 December 2013. ^ "Farooq Sheikh: Parallel cinema's blue eyed boy". dna. Retrieved 16 October 2014. ^ "Farooq Sheikh: A tribute to parallel cinema's blue-eyed boy". Retrieved 16 October 2014. ^ "Farooque Shaikh, aam admi of Indian cinema, dead – The Times of India". The Times Of India. ^ "Farooque Shaikh was polite to a fault, witty and generous – The Times of India". The Times Of India. ^ "An actor and a gentleman". Mumbai Mirror. Retrieved 16 October 2014. ^ Abu Dhabi Film Festival to celebrate 100 years of Indian Cinema Archived 28 December 2013 at the Wayback Machine. DearCinema.com (10 October 2013). Retrieved on 28 December 2013. ^ "Farooq Sheikh, parallel cinema's blue eyed boy - India News Analysis Opinions on Niti Central". India News Analysis Opinions on Niti Central. Archived from the original on 25 October 2014. Retrieved 16 October 2014. ^ "Vereran actor Farooq Sheikh, 65, dies in Dubai". livemint.com/. Retrieved 16 October 2014. ^ "Movies - Meet the frownies". livemint.com/. Retrieved 16 October 2014. ^ "Shabana Azmi: I can't believe Farooque Shaikh's gone so suddenly". Rediff. 28 December 2013. Retrieved 16 October 2014. ^ "Deepti Naval: Farooque Shaikh was not sick at all". Rediff. 28 December 2013. Retrieved 16 October 2014. ^ "RIP Farooque Shaikh: No letters in blood for him, but a fine actor, liberal Muslim". Firstpost. Retrieved 16 October 2014. ^ Club 60 Movie Review Archived 28 December 2013 at the Wayback Machine. Realbollywood.com (6 December 2013). Retrieved on 28 December 2013. ^ Actor Farooque Shaikh dies of heart attack, Amitabh Bachchan, SRK react. Hindustan Times (28 December 2013). Retrieved on 28 December 2013. ^ When Tumhari Amrita Becomes Aapki Sonia. Financial Express (22 February 2004). Retrieved on 28 December 2013. ^ Mahmood, Rafay. (19 June 2013) Sajid Hasan all set for Aapki Soniya – The Express Tribune. Tribune.com.pk. Retrieved on 28 December 2013. ^ Tumhari Amrita turns 20 Archived 28 December 2013 at the Wayback Machine. Hindustan Times (20 February 2012). Retrieved on 28 December 2013. ^ The Sunday Tribune – Spectrum. Tribuneindia.com. Retrieved on 28 December 2013. ^ "Shabana Azmi, Deepti Naval Break Down At Farooq Sheikh's Funeral". 1 January 2014. Retrieved 20 October 2015. ^ "Veteran Actor Farooq Sheikh dies of Heart Attack". 28 December 2013. Retrieved 20 October 2013. ^ "Google Honours India's Beloved Farooq Sheikh On His Birth Anniversary With A Beautiful Doodle". Scoopwhoop. 25 March 2018. Retrieved 9 April 2019. ^ "Farouque Shaikh's 70th Birthday". Google. 25 March 2018. Retrieved 9 April 2019.